The Roman helmet design differs from the Greek helmet as it is in fact, an iron or steel skull cap that is strengthen by two cross-bands that are furnished with a hollowed neck-guard at the back. 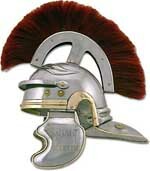 In the front the Roman helmet is finished with a narrow band or it has a small bar that acts as a visor. Cheek-pieces of iron fastened this helm under the chin and a ring placed at the crossing of the two strengthening bands took the place of a crest. When marching, the Roman soldiers would slung their helms by the clasped cheek-pieces from their right shoulders. The Roman helm was worn by both the equites and the vlites was considerably widened at its base and also much flattened in its contour.